Samaritan’s Purse is working in Northern California in the wake of vicious wildfires. Volunteers are needed. 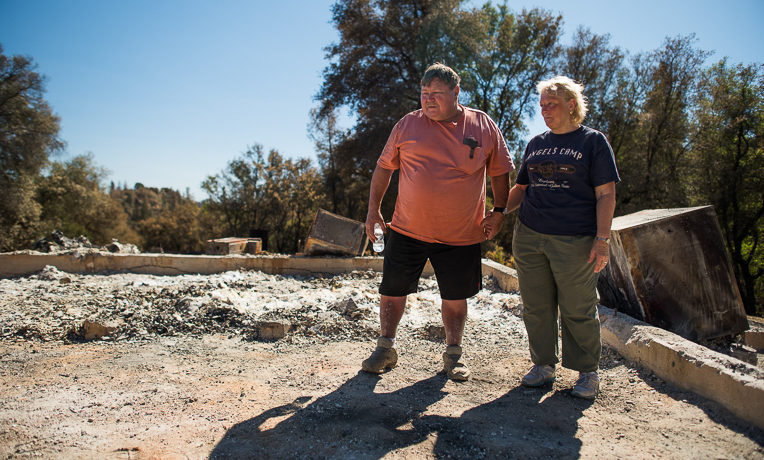 Having just fled through the flames themselves, Randy and Leona Raines received a frantic phone call from an elderly neighbor as the Valley Fire advanced on Clearlake, California. The neighbor was stuck in his garage and didn’t know how he could escape. Randy and Leona raced back to their friend’s home and rescued him. As they departed their neighborhood for the second time, the Raines witnessed flames engulfing their home. To Randy, the scene looked like a war zone. This past weekend, Randy and Leona returned to the charred remnants of what once was their house. Only the scorched concrete foundation remained. Volunteers with Samaritan’s Purse came alongside the Raines to help them delicately sift through the ashes to salvage any belongings that survived the flames. They were able to find some coins, some items their daughter had made as a child and other precious memorabilia. Samaritan’s Purse volunteers are combing through rubble to find precious belongings. As is the case with each homeowner they help, Samaritan’s Purse volunteers presented a Bible to the Raines. “It was a blessing to be able to assist them,” said Jonathan Blevins, program manager coordinating relief efforts for Samaritan’s Purse in the area ravaged by the Valley Fire. Our disaster relief unit—a tractor-trailer stocked with generators, tools, and supplies for our work—is stationed at Harvest Fellowship in Clearlake in Lake County. 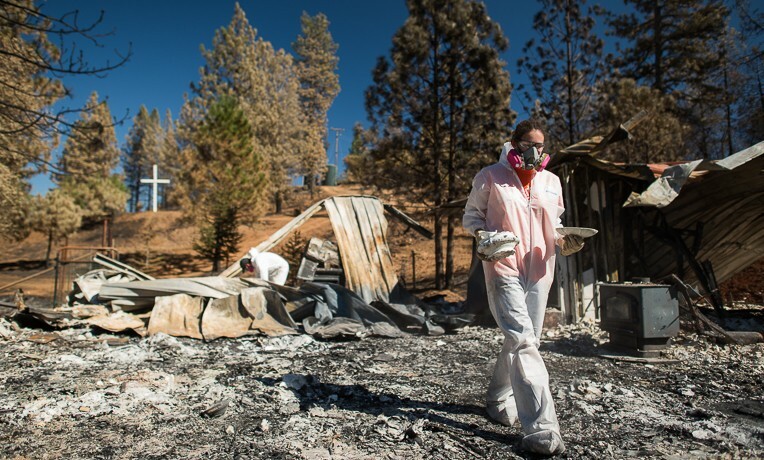 Samaritan’s Purse volunteers search through the ruins of a home destroyed by the Valley Fire. Blevins said our teams also had the opportunity to minister to homeowners on Cobb Mountain as they were allowed back into the area to see their homes since fleeing the raging Valley Fire. Blevins was referring to the orange shirts that Samaritan’s Purse crew members wear at each work site. “It’s good to be able to put boots on the ground and start reaching out to homeowners, helping them find some items they can salvage and being able to reach them and have that ministry opportunity,” he added. 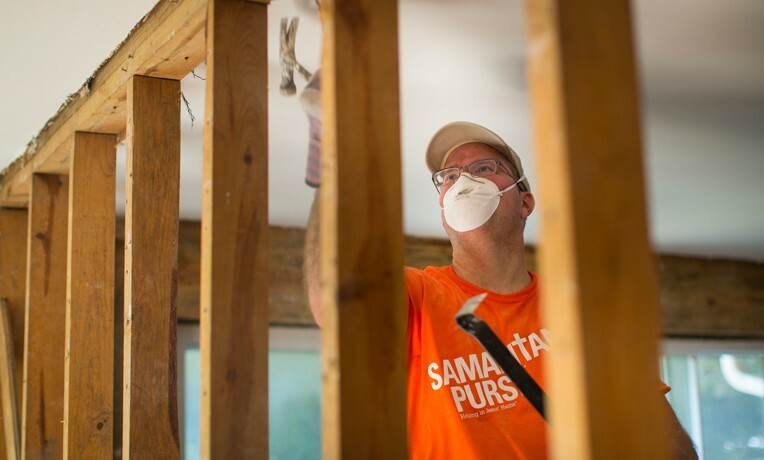 Samaritan’s Purse also has teams working with homeowners in the San Andreas area affected by the Butte Fire. Our disaster relief unit there is based at San Andreas Community Covenant Church in Calaveras County. More than 250 families in both locations have requested assistance from Samaritan’s Purse. That number increases daily as word spreads swiftly that we are there and can be trusted to help homeowners with compassion and dignity. 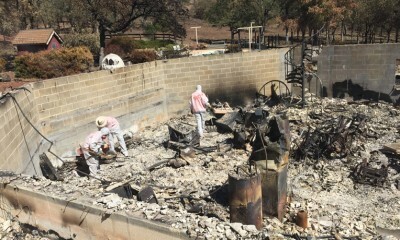 The Aharts look over the ruins of their home, which was destroyed by the Butte Fire. “What a blessing, that God continues to open the hearts here and allow the trust to be established,” said Tony McNeil, who is spearheading our efforts there. “Our volunteers are nothing short of amazing as they work in very hot and dry conditions, all for the glory of God,” he added. Also, in each locale, Samaritan’s Purse is visiting churches and recruiting volunteers. More are needed; click here to be directed to our volunteer network. Billy Graham Rapid Response Team chaplains are also on hand to provide spiritual and emotional care to homeowners as they return to their property. And they are seeing people respond to the Gospel of Jesus Christ and make decisions to follow Him. Please pray for our teams as they battle tough weather conditions to come alongside homeowners to serve them in Jesus’ Name. “Two are better than one, because they have a good reward for their labor. For if they fall, one will lift up his companion. But woe to him who is alone when he falls, for he has no one to help him up” (Ecclesiastes 4:9-10, NKJV).